Up for auction now is a set of the two-volume Cemetery Dance release. Stephen King’s Secretary of Dreams Volumes One and Two Gift (slipcased) Editions. World Fantasy Award winner Cemetery Dance Publications, critically acclaimed artist Glenn Chadbourne, and New York Times bestselling author Stephen King are proud to announce The Secretary of Dreams, the master of horror’s first unabridged graphic short story collection! This second venture into the world of Stephen King’s stories contains even more artwork and detailed illustrations that could only have come from the inspired hands of artist Glenn Chadbourne! 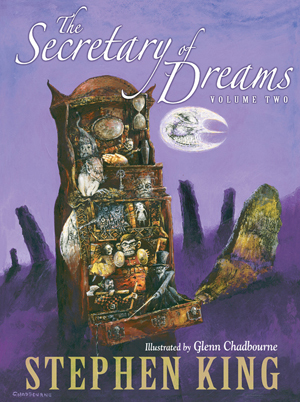 The Secretary of Dreams (Volume Two) continues where the first acclaimed volume left off: combining classic tales of terror from the mind of Stephen King with the haunting artwork of Maine artist Glenn Chadbourne. This unique book displays an incredible and original blend of King’s words with Chadbourne’s one-of-a-kind B&W illustrations: text and artwork brought together to tell these chilling stories in a whole new way. As you venture into this new volume of The Secretary of Dreams you’ll discover “The Monkey,” “Strawberry Spring,” and “In the Deathroom” presented on beautifully designed oversized pages. These stories are heavily illustrated with spot artwork, full page illustrations, and even multiple-page art spreads. Dozens of painstakingly crafted illustrations bring King’s characters to life. Also within this collection are “Gray Matter,” “One for the Road ,” and “Nona,” which appear for the very first time in full graphic format as imagined by Chadbourne. Not one word from King’s original manuscripts has been left out. Instead Chadbourne presents the stories through a variety of techniques: traditional paragraphs of text merged directly into the artwork, handwritten bursts of dialogue to convey emotion, and even multiple fonts to match the mood of each scene. The auction page is HERE! Remote-bidding from anywhere within Australia or internationally is available! A mass of new auction items!